Irina Peskova from the village of Palekh has painted this interesting box. 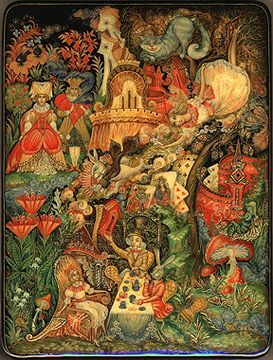 It shows an episode from Lewis Carroll's classic tale "Alice in Wonderland". On the first plan at the bottom of the composition an artist depicts a recognizable moment from "Alice in Wonderland": Alice, the March Hare, the Hatter, and the Dormouse have tea. The Hatter tells Alice that the Time has taken offence and stopped; and now it will be always 5 o'clock. It is the time of afternoon snack in England, when English men usually drink tea, and that is why the March Hare, the Hatter, and the Dormouse are always obliged to drink tea. The palette is very bright and filled with oranges, reds, greens and blues. Gold and aluminum paints are used to add detail throughout the scene. The scene is framed with a golden line. The sides are covered with beautiful pattern painted in gold and aluminum paints. The box is constructed from paper-mache. Black lacquer was used to paint the exterior of the piece while red lacquer completes the interior of the box. A hinge is fastened at the left, and the box rests on four small round legs. Peskova has signed and dated (2009) her work and wrote Palekh at the left bottom corner of the composition.